Different types of load cells are used for different applications. For example, when intrinsic safety and hygiene are required, a pneumatic load cell is used. In a situation where use in remote locations is required, hydraulic load cells would be the ideal kind. Strain gauge load cells can be used for almost all industrial application and they are very versatile. Tension load cells which are also commonly called compression load cells are ideal for applications where the load may go from tension to compression, or from compression to tension. They are very suitable for environments that restrict space, and their threaded ends allow for easy installation. Tension load cells are very versatile with low profile and welded stainless steel design. They are very accurate in measuring compression and tension forces. These kinds of tension load cells, especially those that have male threaded stud connections for load attachment, are designed to collect tension and compression information under harsh conditions. They are also able to measure bi-directional units which range from 1kg to 100 tons in 2″ diameter with an FSO linearity of +/- 0.15%. The tension load cells have an internal design that allows for superior long-term stability and significantly reduces the effects of small-axis loads. Tension load cells are highly accurate and leave a small footprint. Some advantages of tension load cells include easy installation, high accuracy, reliability, ability to be customized, high side load reduction, better sealing and protection, small, and inexpensive. 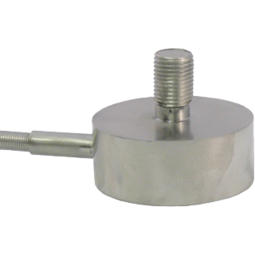 Some downsides of the tension load cell are that the strain gauges are exposed and require protection, no load movement is allowed and the loads must be centered. 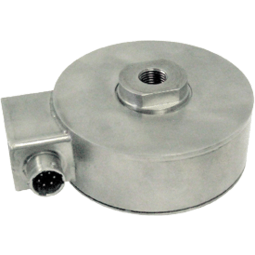 Therefore, there are a few things to consider when purchasing a tension load cell. Some of these considerations include the duration of measurement (short-term duration with a tare, or long term duration without a tare), output requirements, direction of loading (tension/compression, or both), percent of accuracy requirement (as a percent of reading or full scale output), operating temperature conditions, options for mounting, certification requirements, operation costs, and other accessories needed. Tension Load Cells Load cells are transducers which convert pressure or force and give a measurable electrical output.